TransLink is warning transit riders that there could be longer waits on the Expo Line and Millennium Line due to intentionally reduced service. 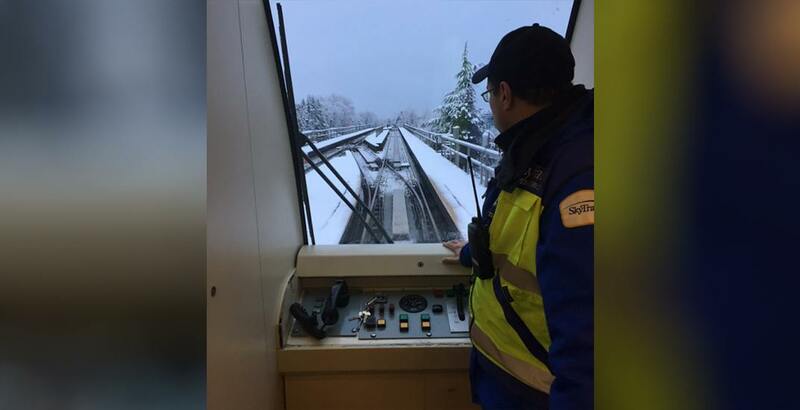 Both SkyTrain lines are currently operating in snow mode, which entails manually operating all trains. SkyTrain’s high frequencies are usually allowed by depending on driverless automated train control, but this is currently not possible due to the weather conditions. With each train now staffed by a SkyTrain attendant, this means reduced frequencies and slower running speeds; TransLink says it has as many trains in service as staffing allows, and there is no set frequency. Staff have been added to drive trains and coordinate service inside the stations. As well, track intrusion alarms at station platforms are turned off as falling snow and ice have been triggering false alarms that unnecessarily stop trains and create delays. Instead, track intrusion is being monitored manually. The Canada Line is currently operating normally. Transit buses are still experiencing delays from slower operations and ice buildup from Sunday’s snowfall accumulations. TransLink says it is also salting and sanding all bus loops to prevent slipper surfaces, coordinating with municipalities on snow clearing if priority routes are impacted, deploying special trucks to spread anti-icing solution on trolley wires, and installing brass ‘cutters’ on some trolley buses to cut through ice buildup on trolley wires. Coupled with slower transit operations and the surge in transit ridership from regular drivers leaving their cars at home, overcrowding and delays on public transit are expected to continue during these weather conditions. Snowfall resumed at approximately 4 pm today, and it is forecast to continue throughout much of Tuesday. Environment Canada expects up to 15 cm of additional accumulation by the time the weather system tapers off tomorrow. Road conditions and transit operations can quickly change and deteriorate. For the latest on transit service disruptions, visit TransLink’s website.